Automotive advertising is definitely going to decrease in the coming months and possibly years. 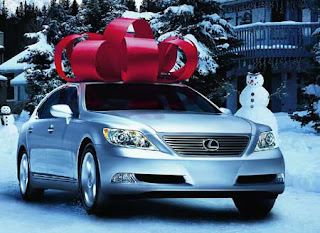 One of the changes happening in Christmas 2008 is a decrease of the buy a car for your loved one Christmas ads, most commonly associated with Lexus. The big red bow car ads will be replaced by less ostentatious messaging. Honda will be extending their TV spots with online media placements that will donate $1 to charity for every registration on their site. It's the softer, community approach that will be more common this year than the overtly festive approach of prior holiday sales events. With sales numbers way down across the industry, Honda's strategy of getting hand-raisers to communicate to via a charitable gift enticement could be a good way to obtain leads as the economy recovers. This is disappointing news as I was hoping Santa would bring me a new car for Christmas (I always ask, never receive.) Oh well, it's a time to be thankful for what you have, not what you want. Maybe I'll just ask for some new micro-fiber towels to wash what I own. more.